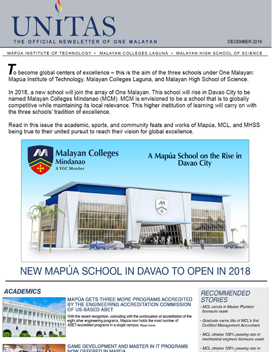 To become global centers of excellence - this is the aim of the three schools under One Malayan: Mapua Institute of Technology, Malayan colleges Laguna, and Malayan High School of Science. In 2018, a new school will join the array of One Malayan. This school will rise in Davao City to be named Malayan Colleges Mindanao (MCM). MCM is envisioned to be a school that is to globally competitive while maintaning its local relevance. This higher institution of learning will carry on with the three school's tradition of excellence. More news in this issue of Unitas. The new school year 2016-2017 for the Mapúa Institute of Technology, Malayan Colleges Laguna, and Malayan High School of Science welcomed the pilot batch of senior high school students. The same level of excellence in academics being initially offered for its students will be offered to the new senior high school students. The senior high school is a stepping stone for success in college and professional life. The promise of academic excellence is sustained, world class education is assured, and more brave strides are being made in sports, community relations. 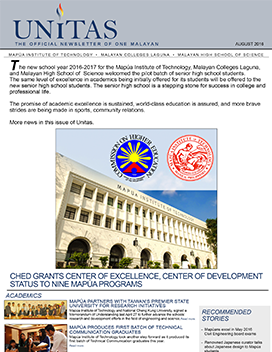 In this issue, Mapúa Institute of Technology and its wholly owned subsidiaries Malayan Colleges Laguna and Malayan High School of Science once again proved that success is sweeter when shared and there is much more to achieve when united. Mapúa celebrated its 91st foundation anniversary along with the 10th anniversary of both Malayan Colleges Laguna and Malayan High School of Science. These celebrations highlighted the recent recognitions of the three schools and bolstered their commitment to further improve their systems and learning experiences for the students. PTC-ACBET gave full accreditation to four more Mapúa’s engineering programs and the Commission on Higher Education designated Mapúa and MCL programs as centers for excellence and development. The three schools will be offering senior high school in June 2016 with the aspiration of imparting excellent technological and scientific education to the youth and molding them to be good citizens of the country. Read about these in Unitas. 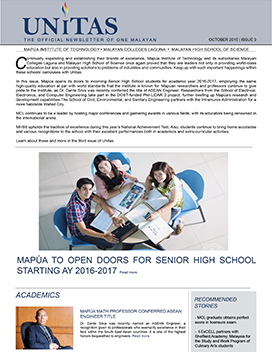 In this issue, Mapúa opens its doors to incomng Senior High School students for academic year 2016-2017, employing the same high-quality education at par with world standards that the Institute is known for. Mapúan researchers and professors continue to give pride to the Institute, as Dr. Dante Silva was recently conferred the title of ASEAN Engineer. Researchers from the School of Electrical, Eleclronics, and Computer Engineering take part in the DOST-funded Phil-LiDAR 2 project, further beefing up Mapua's research and development capabilities. The Schoolof Civil, Environmental, and Sanitary Engineering partners with the Intramuros Administration for a more habitable Walled City. MCL continues to be a leader by hosting major conferences and garnering awards in various fields, with its educators being renowned in the international arena. MHSS upholds the tradition of excellence during this year's National Achievement Test. Also, students continue to bring home accolades and various recognitions to the school with their excellent performances both in academics and extra-curricular activities. Learn about these and more in the third issue of Unitas. 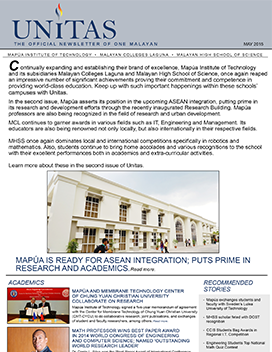 In the second issue, Mapua asserts its position in the upcoming ASEAN integration, putting prime in its research and development efforts through the recently inaugurated Research Building. 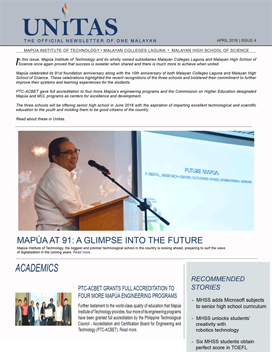 Mapua professors are also being recognized in the field of research and urban development. MCL continues to garner awards in various fields such as IT, Engineering and Management. Its educators are also being renowned not only locally, but also internationally in their respective fields. MHSS once again dominates local and international competitions specifically in robotics and mathematics. Also, students continue to bring home accolades and various recognitions to the school with their excellent performances both in academics and extra-curricular activities. Learn more about these in the second issue of Unitas. 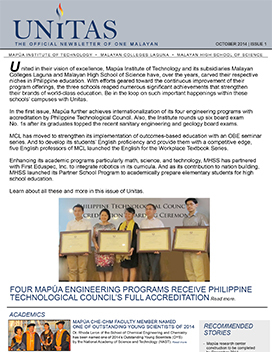 In the first issue, Mapua further achieves internationalization of its four engineering programs with accreditation by Philippine Technological Council. Also, the Institute rounds up six board exam No.1s after its graduates topped the recent sanitary engineering and geology board exams. MCL has moved to strengthen its implementation of outcomes-based education with an QBE seminar series. And to develop its students' English proficiency and provide them with a competitive edge, five English professors of MCL launched the English tor the Workplace Textbook Series. Enhancing its academic programs particularly math,science,and technology, MHSS has partnered with First Eduspec, Inc. to integrate robotics in its curricula. And as its contribution to nation building, MHSS launched its Partner School Program to academically prepare elementary students for high school education. Learn about all these and more in this issue of Unitas.